Amongst the empties from August I discussed the Warburtons giant crumpets and how they were great to have at lunch time and put them with cheese or eggs but how they seemed a little less breakfast time suitable. Instead I discussed how it worked out a lot better value for money to just get smaller ones and do two because ultimately you can still put the same things on them it just might involve a minor balancing act to get an egg yolk over both of them (if you really do not want to do two eggs). These ASDA ones are the same price as the two giant crumpets but are clearly going to last you a lot longer. Whenever we do an ASDA order I tend to get two packs of these and pop them both into the freezer. We have a defrost setting on the toaster that helps to defrost and lightly cook the crumpet before I pop them under the grill to crisp up and go a little more golden. 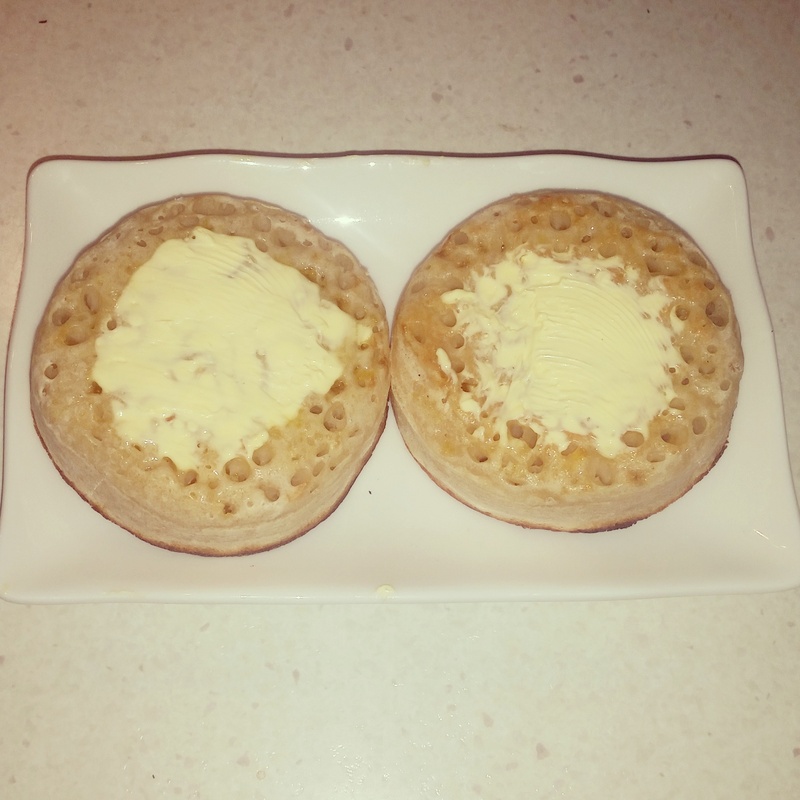 Whilst I have encountered a couple of bad brands (or non-brands) of crumpets over the years with some lacking that real light, fluffy and hole nature and instead being a little heavy and just not seeming to have formed properly the majority of crumpets I have tried are fairly decent. I always return to ASDA ones though because they are cheaper than the proper brands but pretty much live up to the same quality standards in every single way. The holes are well formed throughout the crumpet and if you put some butter on a properly warmed up one it will seep through to the bottom of the crumpet which really helps to ensure it is not dry at all. But on their own they are not at all greasy and you cannot tell that they have been cooked in butter or oil and that is always great for making you feel a little bit better about starting your day with them. 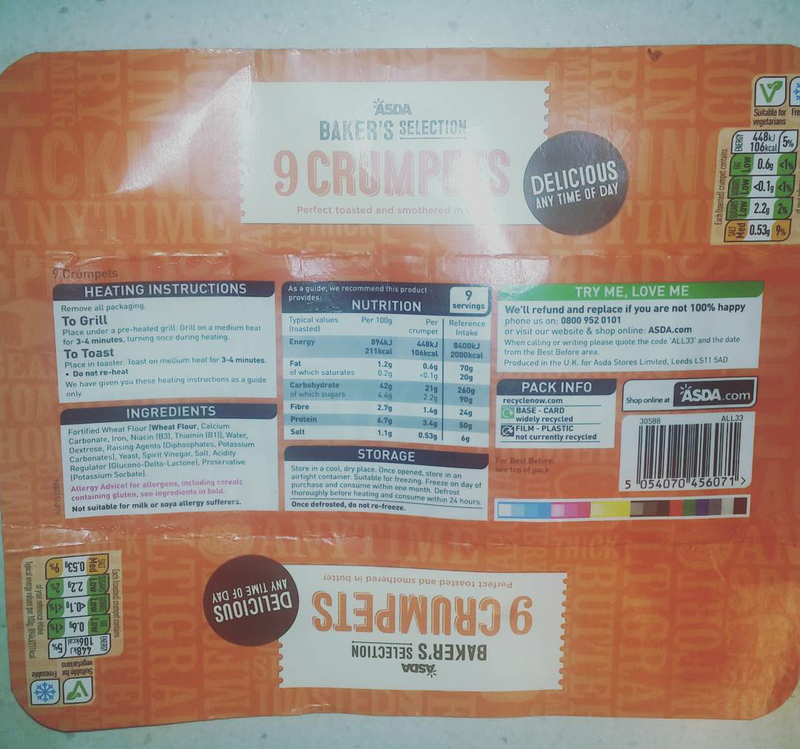 One crumpet is just over 100kcal and with that whilst they are ‘great any time of day’ I would only recommend them to you as an evening snack if you know you are way under your intake or have burned a lot of calories off during the day (though a once in a while treat is not going to hurt anybody). but they are certainly a fabulous way to fill up and fuel up for the day ahead by having these at breakfast or topping up your energy levels at lunchtime (providing you have the time and equipment to heat them up with in your home or workplace). This entry was posted in Food and Drink, Product Reviews and tagged asda, breakfast, comfort food, Cook, cooking, cooking tips, dinner, eat, eating, food, Food and Drink, food blog, food blogger, food bloggers, food costs, food pictures, food product, food review, food reviews, foodie, lblogger, lbloggers, life, Lifestyle, lifestyle blog, lifestyle blogger, lifestyle bloggers, lunch, product review, review, snacks, treat. Bookmark the permalink.